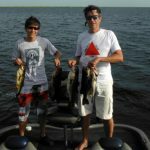 Just 4 Bass was working for Fast Break Bait & Tackle fishing with Mauricio & Pedro Coutinho from Sao Paulo, Brazil. Today we had a split day, 4 hours in early morning(Live Bait) and 4 hours in late afternoon(artificial). Here is a picture of some of the fish today. These are the 1st Black Bass they have ever caught.